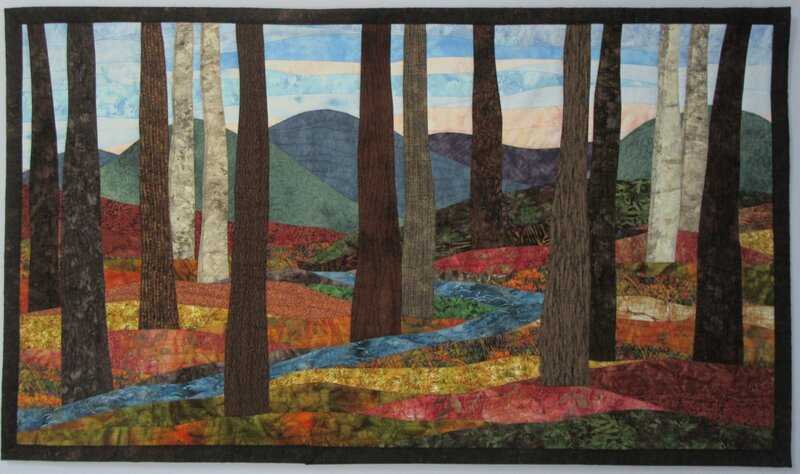 One of my signature art quilts is my Tree design. I’ve worked at creating different backgrounds and different foregrounds, sometimes a creek or stream, and colors of different seasons. 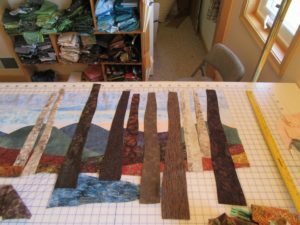 I want to share the basic process for making a landscape tree quilt that has trees placed such that the quilt has depth to it. First I select all the different fabrics I want to use for the different sections of the quilt: Blues for the sky, sometimes Blues and Greens if the quilt is a spring summer season; browns, greys, and beiges for the trees; blue grey for a stream; beige/browns/greys for rocks; and either the colors of fall or summer/spring for the ground cover. 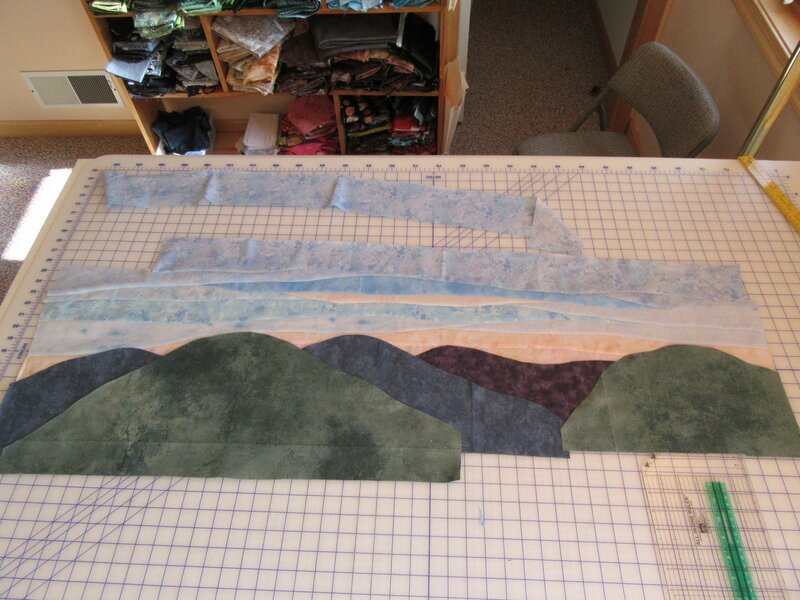 If the perspective of the quilt includes mountains then I have a variety of fabrics for mountains in the distance too. I cut out strips of these different colors. For the horizontal colors the width of the strips is about 4″ and the length is the full quilt width plus a few inches. The tree strips correspond to the height of the quilt and the placement of the trees on the quilt. 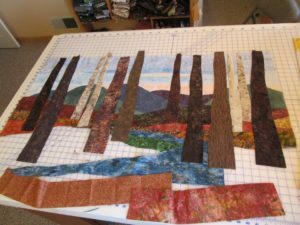 I layout the strips of color on my design table along with the trees, sky, mountains….just to get a very general sense of do I have enough of the colors I like. Then I work on one section at a time. My piecing is two pieces at a time, cutting soft curves using a wallpaper cut technique. I sew first two pieces together, then trim to the width or design I want, then the next wallpaper cut with a third piece, etc. Many of the layers become very thin as I trim them down after sewing them to the previous piece. First the sky pieces are put together, then the mountains are added and then a layer or two of ground. It is very important to figure out the order of the piecing to create the perspective you want. The first trees are usually the smallest in width and height. 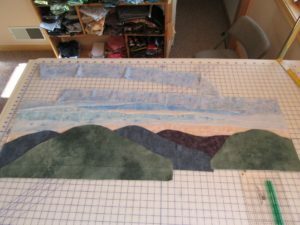 These get cut into the sky/mountains/land part of the quilt created initially. 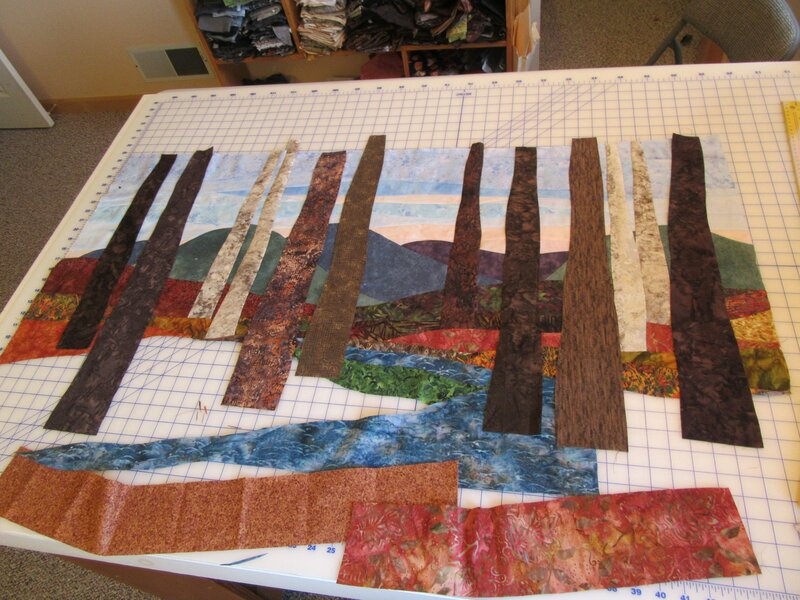 The rest of the quilt construction is a back and forth process of adding ground fabrics and adding trees and adding the stream, the sequence is important to the piecing process. Throughout the construction I recheck my layout, determine how to add the ground cover layers, and determine when each tree is added. This is especially important if you are adding a stream as the placement of those fabric pieces must be sequentially correct. It is b y layering the ground fabrics and adding the trees in at different points in the creation of the ground that you create depth and perspective. 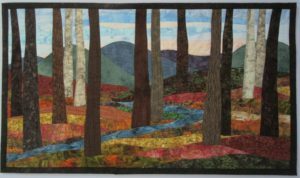 I’ve attached a few pictures from the creation of this Autumn Trees at Sunrise quilt. You can layer foreground trees partially over background trees, especially if you use different fabrics. My goal is to create a beautiful one of a kind quilt, with depth and colors that resemble the season of the quilt. Yet…it is abstract in many ways as there are no branches or leaves or specific details….it is an art quilt of the colors and basic shapes.